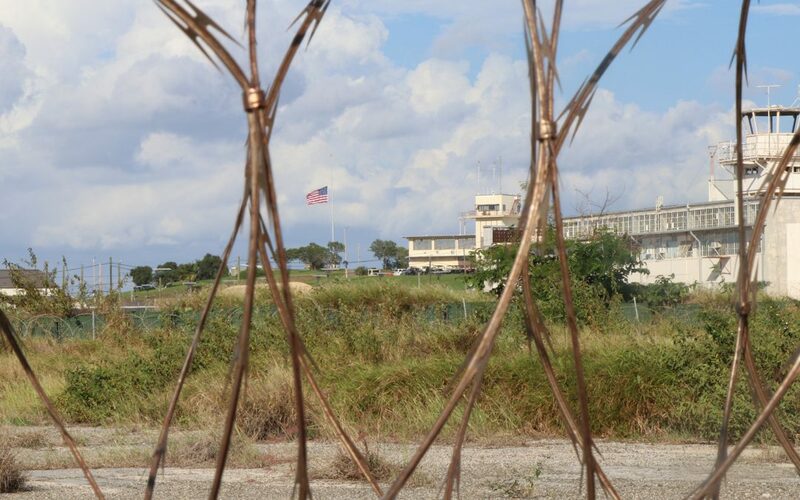 GUANTANAMO BAY, Cuba — The 26th round of pre-trial hearings in the cases of accused 9/11 mastermind Khalid Sheik Mohammed and four other co-conspirators concluded Friday with defense attorneys maintaining that the Military Commission has no jurisdiction because the U.S. wasn’t at war with al-Qaida on Sept. 11, 2001. This week’s hearing focused on 9/11 conspirator Mustafa Ahmad al Hawsawi, a 49-year-old Saudi who was arrested in Pakistan in 2003 and has been accused of assisting at least six 9/11 hijackers, including Mohammad Atta, who the prosecution described as the “ringleader” of the operation in the United States. Like the four other defendants in the case, al Hawsawi would face the death penalty if convicted. Prosecutors argued that the Military Commission holds personal jurisdiction over al Hawsawi as defined by the 2009 Military Commissions Act. The last two points apply to al Hawsawi, according to the prosecution. But Al Hawsawi’s defense team argued that the commission does not have jurisdiction due to a lack of hostilities between al Qaida and the U.S. before the four attacks on Sept. 11. They argue that hostilities began on Oct. 7, 2001 – when the U.S. invaded Afghanistan. The prosecution argued that President George W. Bush, Barack Obama and Donald Trump have all agreed that the U.S. and al Qaida were engaged in hostilities before 9/11 by approving the prosecution of the five alleged co-conspirators in a Military Commissions Court. The defense counsel directly addressed the prosecution’s claim that evidence indicating al Hawsawi’s membership in al Qaida was all they needed for a conviction. They said that participating in al Qaida-coordinated operations, training camps, and associating with al Qaida members did not equate to al Hawsawi’s membership of the organization because he did not take the obligatory oath of allegiance also known as the Bayat, to Osama bin Laden and to al Qaida. Professor Sean Watts, a law of war expert who spent two days on the stand, explained that in order to enact the international law of war there needs to be an examination of the intensity of conflict and the frequency of conflict. In order to prove intensity, the prosecution dissected the details of the 1998 bombings in East Africa, which a group identified by the FBI as being al Qaida claimed responsibility for, saying that there was 10,000 pounds of explosives used and the blasts killed 224 people, including 12 Americans. When asked if this sounded like an “intense” experience, Watts gave a small smile. “In the common meaning of the word, it would be intense,” Watts responded, adding that it would not in the technical definition of the word as it relates to the laws of war. The judge later asked a question to clarify if attacks themselves are what is examined when defining duration of attacks, or can the planning and preparing of attacks be considered. “It is the violence that must be sustained,” Watts said. During their final argument, the defense lawyers pointed to the example of the four terrorists convicted in the East Africa bombings. The trials and convictions took place in a criminal court, not in a military commission. This fact pertains directly to the 9/11 case. Under the Obama administration, then-Attorney General Eric H. Holder Jr. announced in late November 2009 that the Justice Department would try the five alleged 9/11 co-conspirators in a Manhattan federal court, but backed down after backlash from GOP Congress members and others. Alka Pradhan, member of the defense team for Ammar al Baluchi, also referred to as Ali Abd al Aziz Ali, said in a press conference after the week of hearings that this week proved the government does not have lawful jurisdiction over al Hawsawi. The original motion included both al Hawawi and al Baluchi. Before the week began, the judge separated the two defendants and this week was spent focusing on al Hawsawi. The next round of hearings for the 9/11 case is scheduled for January 2018 where the al Baluchi team will begin to argue their piece of the personal jurisdiction motion. James Connell, defense attorney for al Baluchi, said that this process could take the better part of 2018. A significantly different strategy for the pre-trial hearings from the al Hawsawi team whose arguments began and ended this week.